Home / News / Unisport Boot Spots | So many unreleased boots! He just can’t seem to let go can he? And thank god for that, because Didier Drogba still has so much left to give the football world. He took to the pitch for Phoenix Rising FC, the club he is part-owner of, wearing a pair of Vapor of course. He has been a Mercurial Vapor man almost all his career and although he couldn’t seem to pick a colourway, the choice of boot was never in doubt. San Marino don’t get much success on the pitch, but when it comes to wearing unique, old or otherwise “boot spot-worthy” boots, none do it better. Pier Filippo Mazza pulled out a pair of original Predator Mania boots for their game against Germany. There have been two remakes of these, but in the end nothing beats the OG. 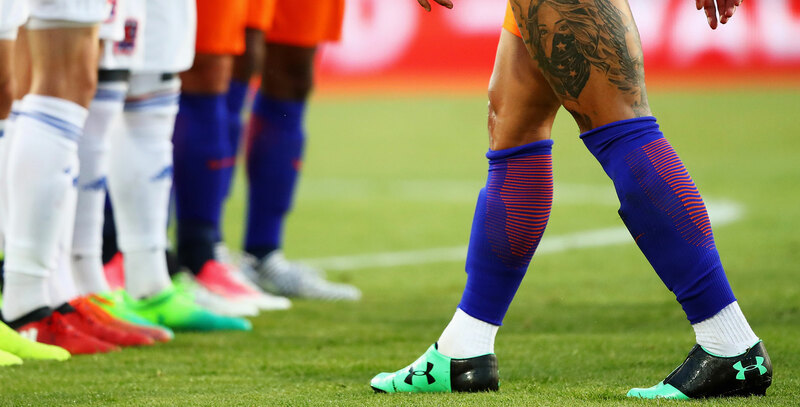 As Holland trashed Luxenborg 5-0 this weekend, there was something previously unseen featuring on the feet of Memphis Depay. Under Armour are ready to enter the laceless fray it seems with a completely new Spotlight generation, which interestingly is made with a noticeable zip construction. It’s a very different take that we can’t wait to try out! Next to wear something hidden and forthcoming was Toni Rudiger, who trained in a pair of Nike test boots. More and more players have been trying out this boot, so something is definitely imminent from Nike and considering the German defenders usual choice of boots, we feel confident in calling these out as Tiempos. The upper once again looks like it adopts the stitch-less design, but apart from that it is hard to discern more. We promised you a week full of unreleased football boots and that’s certainly what you will get. Keisuke Honda took to the pitch for Japan wearing an unseen Mizuno football boot in a blackout colourway. They are doing everything to conceal the design, but there is no hiding the fact that this boot is very different from Honda’s usual Wave Ignitus. When the Nemeziz launched almost a month ago, some thought the boot would be exclusively worn by Messi and his chosen “Backed by Messi” players, like the predecessor. With more and more games being played, that myth has been dispelled by the wide range of players pulling them on. Although he was part of the original “Backed by Messi”-squad, we still wanted to highlight Kasper Dolberg and his adidas NEMEZIZ 17.1. He scored his first international goal for Denmark, as they reignited their hopes of World Cup qualification. With Pogba being the absolute frontman for the ACE silo, he was naturally quick to pick up the recent Dust Storm colourway. He did however get a bit of customisation going, and decided against the bright neon adi stripes on the side and instead had them coloured black to match the rest of the boot. A boot spot that lots of you sent our way and we are happy you did! If you spot any interesting boots, then we really welcome you to DM us on Instagram, as you may have seen something we missed! Are you on the other hand interested in available football boots, then visit our football boots page and see our entire selection of football boots. We guarantee, you'll love it!